Is a 10K walk just a warm-up for you and a marathon no challenge? Then you are ready for the world of ultramarathons! 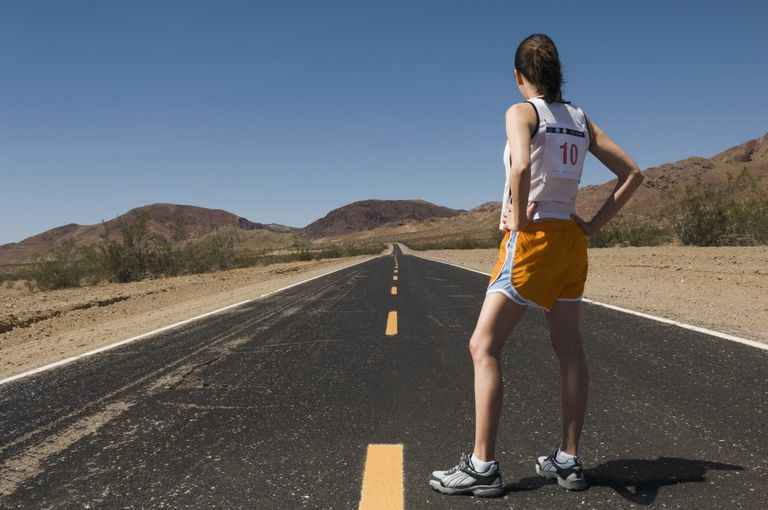 Ultramarathons are walking/running events of any distance above the marathon 42 kilometers (26.2 miles). While these events are usually set up for runners, walkers are welcomed if they can meet the required time cutoffs. Participants can usually take breaks at will throughout the event to eat, rest or refresh. These events may be held on a track or on the road or trail. Ultramarathons pre-date the modern marathon. In the 1800's, "pedestrianism" was a popular sport, whereas the marathon originated in 1896. Today, events are generally welcome both genders. Fixed Distance Ultramarathon Events: Participants cover a fixed distance, such as 50 kilometers or 100 miles. This may be on a set course from point to point in a loop, or may be on a course which loops itself and the participants stop when they complete the distance. Time Limited Ultramarathon Events: 24 Hour or 48 Hour, etc. events where the participants attempt to cover the greatest possible distance within that period of time. Track: historical ultra walks were often held on a racetrack, with the walkers endlessly circling the same course. Road Loop: A course set out on a road, sidewalks or trail meant to be repeated. One example is the Ultra Centric Experience in Texas, with a 2-mile loop course. Single Circuit: A course of a set distance to be completed once, returning to the starting point. For an ultramarathon, it would be more than 42 kilometers long. Point-to-Point: The start and finish are in different locations, with a fixed-distance course between them. Standard events are 50 kilometers, 50 miles, 100 kilometers, 150 kilometers, 100 Miles, 24 Hours, 200 KM, 48 Hours, 200 Miles, Six Days, 1000 KM and 1,000 Miles. There are many non-standard events as well. Most of the 100 Mile events in the USA are on natural trails or forest roads and many involve altitude changes equal to climbing Mt. Everest from sea level! The IAAF recognized the 100-kilometer distance in 1991. They recognize the International Association of Ultrarunners (IAU) as the governing body for the sport of ultrarunning. The IAU hosts 100-kilometer, 50-kilometer, 24-hour and trail world championships. Ultra events are usually designed with runners in mind. Fast walkers can often successfully complete the event in the given cutoff time, but walkers must check carefully with the event organizers to make sure they will be welcomed. FANS Ultra Races: This event is held in Fort Snelling Park, Minneapolis, Minnesota in June. It includes a 6-Hour Run, 12-Hour Run or Walking Race, and a 24-Hour Run or Walking Race. You can earn your Centurion designation by walking 100 miles during the 24-hour race. Great Walk in British Columbia, Canada. This event was last held in 2014, but may return. The 18-Hour Walk in 1999 and 2000 gave walkers a challenge. This event had a combination of a 1-mile road circuit and three 10-kilometer (6.2 miles) road circuits for variety. Walkers began at dawn at 6 am and had to end at midnight, 18 hours later. The 29 walkers who attempted it the first year included travelers from the Netherlands, Great Britain, and Canada in addition to the USA. Three walkers walked for over 100 kilometers (62 miles). How Do You Become a Centurion Ultrawalker?